More recent strata lie on top of older strata, except when they lie beneath them. Radiometric dates obtained by different methods always agree, except when they differ. And the planets in their courses obey Newton's laws of gravity and motion, except when they depart from them. As Isaac Asimov reportedly said, "The most exciting phrase to hear in science, the one that heralds new discoveries, is not 'Eureka!' [I have found it], but 'That's funny …' " And there is nothing that distinguishes so clearly between the scientific and the dogmatic mindset as the response to anomalies. For the dogmatist, the anomaly is a "gotcha", proof that the theory under consideration is, quite simply, wrong. For the scientist, it is an opportunity. If an idea is generally useful, but occasionally breaks down, something unusual is going on and it's worth finding out what. The dogmatist wants to see questions closed, where the scientist wants to keep them open. This is perhaps why the creationist denial of science can often be found among those professions that seek decision and closure, such as law and theology. Dogmatists regularly invoke the name of Karl Popper, and the work he did in the 1930s. Popper placed heavy emphasis on falsifiability, denouncing as unscientific any doctrine that could not be falsified. Freud's theories, for example, were unscientific, because a patient's disagreement with its findings could be explained away as the result of repression. Marxism, likewise, he regarded as unscientific because when events failed to unfold as Marx had predicted, his followers could always say that the right historical conditions had not yet arisen. The theory that biological diversity is a product of Intelligent Design is also unscientific by this criterion, since its advocates can and do say1 that any apparent failure of design may merely reflect our lack of insight into the motivations of the designer. But what about theories that almost all of us would agree to regard as scientific, such as the theory of planetary motion, or atomic theory, or the theories of geology, or of the origin of species by evolution? Here, current thinking can be and at various times has been falsified by observation. But what, precisely, was falsified? No theory exists on its own, as the philosopher-scientist Duhem pointed out over a century ago,2 and when a theory fails an observational test there are two kinds of possible explanation. The fault may lie with the theory itself, or with the assumptions we make while testing it. More specifically, as Lakatos pointed out in 1970,3 every application of a theory involves ancillary hypotheses, which can range from the grandiose (the laws of nature are unchanging) to the trivial (the telescope was functioning correctly). When a theoretical prediction fails, we do not know if the fault is in one of these, rather than the core theory itself. Much of the time, we are not even aware of our ancillary hypotheses, which is one reason why we need philosophers of science. Lakatos goes further. To simplify one of the most subtle and influential papers in the philosophy of science, every scientific theory gives rise to anomalies, as revealed by observation. But there is no such thing as a pure observation, because observation is nothing without interpretation, and every interpretation is theory-laden. That last statement is not, as it might seem, a weakness of observational science, but a hidden strength. It implies that, when we use observations to test a theory, we are also as a bonus testing the implicit assumptions that we use to interpret our results. No scientific theory is rejected simply on the basis of its anomalies. It is rejected only when a superior theory is put forward, and the new theory is superior if it explains as much as the old theory, and more besides. Thus we should not even see theories as existing in isolation, but as part of a sequence or research programme. You are bound to be wrong, but don't let that worry you unduly, because error is opportunity, and the way science progresses is by being less wrong about more things. I find this viewpoint liberating. Take as our first example the motion of planets in the Solar System. According to Kepler's Laws, which follow from Newton's laws of gravity and motion, these should follow elliptical orbits, as a result of the gravitational attraction between each planet and the Sun, slightly perturbed by the attraction of the planets for each other. In the mid-19th-century, accurate observations showed that the orbits of two planets, Mercury and Uranus, were anomalous. The anomaly in the orbit of Uranus could be explained by the gravitational influence of an additional planet, whose position could be calculated, leading to the discovery of Neptune. The anomaly in the orbit of Mercury, however, could not be resolved in this way, and remained unexplained until the formulation of Einstein's General Theory of Relativity. In the case of Uranus, the anomaly was associated with the ancillary hypothesis that we had a complete list of planets, and it was this ancillary hypothesis that was overthrown. In the case of Mercury, however, the shortcoming was in the theory itself. Consider now another example, also discussed by Lakatos. In 1816, the Scottish physician William Prout conjectured that all chemical substances were condensates of hydrogen, thereby explaining the fact that in the case of gases, their densities (and we would now say4 molecular weights), relative to hydrogen, were whole numbers. In rebuttal, Stas pointed out that the relative density of chlorine was 35.5. So Prout was wrong. This is the story that I learnt at school, as an edifying tale of how an over-ambitious theoretician was given his comeuppance by a scrupulous experimentalist. Not so. In this particular case, Stas had used all means at his disposal to purify the chlorine, and therefore assumed (a key theoretical assumption) that he was dealing with a pure substance. In terms of the present discussion, we would say that Stas's experiment did not disprove Proust's conjecture, but, rather, the conjunction of that conjecture with the ancillary hypothesis that his chlorine was a pure single substance. It was not until much later that it became clear that the atomic weight of 35.5 arises because chlorine is in fact a 3:1 mixture of two different kinds of atom, chlorine-35 and chlorine-37. Isotopes, separate substances differing in weight, but with virtually indistinguishable chemical properties, and therefore occupying the same place (Greek, isos, same, topos, place) in the Periodic Table. So the mismatch between Prout's prediction and Stas's observation results from the failure of the ancillary hypothesis, while the relative densities of the two separate isotopes, 35 and 37, are indeed whole numbers, to within the limits of measurement at that time, just as Prout's conjecture requires. Even when Prout's conjecture appeared to have been disproved, it remained a focus of interest. After all, many elements, including carbon, nitrogen, oxygen, fluorine, sodium, aluminium, an even platinum and gold, have atomic weights very close to a whole number.5 This is, to say the least, suggestive, so much so that in 1888 Lord Rayleigh, one of the UK's most distinguished scientists, decided to redetermine the density of nitrogen as accurately as he could. He used two separate methods to obtain nitrogen. One method was decomposition of ammonia, which is a compound of nitrogen and hydrogen. The other was from air, by removal of water vapour, oxygen, and carbon dioxide. To his surprise, the densities did not agree; "atmospheric" nitrogen was slightly but measurably denser than "chemical" nitrogen. The difference was only one part in a thousand, but there was no reason to expect any difference at all. L: Vanity Fair caricature of Ramsay lecturing on the Periodic Table. He is pointing to Group VIII, the noble gas elements, that he and Rayleigh discovered and of which argon (here labelled A rather than Ar) was the first member to be identified as such. Click for larger image. Unable to resolve this anomaly, Rayleigh appealed publicly for assistance, and got it from William Ramsay, Chemistry Professor at University College London, who happened to know of an earlier anomalous finding involving air. In 1785, Henry Cavendish had sparked together air and oxygen, and found that they reacted together to give products that were soluble in water,6 but a small fraction of the air, around 1%, failed to react. This led Ramsay to suggest that air contained an extra, hitherto unidentified, constituent. Removal of oxygen and nitrogen7 did indeed leave behind a relatively dense, highly unreactive, gas which Ramsay and Rayleigh christened argon, "the lazy one". From the perspective of this essay, Rayleigh's initial thinking included the ancillary hypothesis that all the components of air had been identified. This was not true, and (as readers with our knowledge of chemistry will be aware) the additional component was to play a vital role in explaining chemical bonding. It is more than 350 years since Steno (who eventually became a bishop) proposed that strata consisted of layers of rock laid down one on top of another, newest on top. We have known for over two hundred years that both the London and Paris basins are filled with relatively recent sediment, on top of marine deposits (chalk or limestone) that emerge in hills to the North and South, that these in turn rest on an older basement, and that the more recent sediments were laid down in layers. 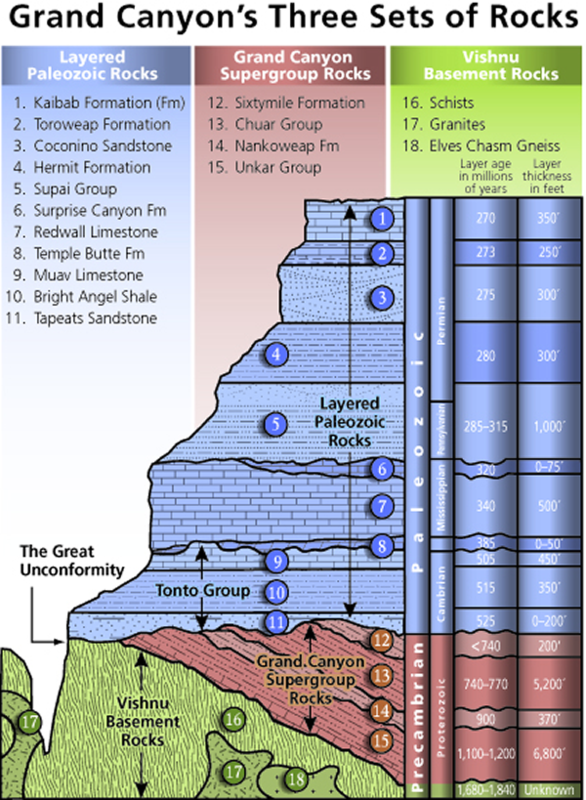 The familiar geological column, Precambrian upwards (click to enlarge), was established in something like its present form before 1860, although it was not until the 20th Century that it was recognised that the Precambrian occupied far more of the Earth's history than everything since that time. One such major disruption of the usual order occurs in the northwest of Scotland, where older rocks lie above younger along a 200 km front. The resulting confusion (the "Highlands Controversy", fuller account here) was not resolved until the 1880s, with the recognition of what is now known as the Moine Thrust. This was the first established example of an overthrust, where compression has forced one layer of rock over the top of another, as in the diagram to the left. In time, no doubt, the uppermost yellow and brown layers will be eroded, leaving the orange directly above the much younger brown, to the confusion of geologists. The Moine Thrust belt provides extreme examples of this. Thus at the location illustrated below the upper rock is Precambrian gneiss (igneous rock that has undergone extensive change when buried at depth), while the well-bedded rock beneath it is Cambrian quartzite (compressed sandstone), at least a billion years younger. R: The Glencoul Thrust at Aird da Loch, Assynt in Scotland, part of the Moine Thrust belt; the irregular grey mass of rock is formed of Archaean or Paleoproterozoic Lewisian gneisses thrust over well-bedded Cambrian quartzite, along the top of the younger unit. Click to enlarge. The Moine Thrust region was described, and interpreted invoking thrust faults, between 1888 and 1907. At that time, there was no known mechanism to generate the relevant forces, but this illustrates the general thesis that historical science trumps physical science. We know what happened, even if we don't know how it could have. On current thinking, the thrust zone was generated during the process that gave rise to the mountains of Northwest Scotland, when Baltica (now part of Eurasia) drove west into Laurentia (roughly, North America and Greenland), 425 – 400 million years ago. But when the overthrusts in this region were first recognised, plate tectonics was still decades in the future. I would also mention here another famous overthrust; the Lewis Overthrust in Montana, where Precambrian limestone rests on top of Cretaceous shales. Chief Mountain (illustrated L; click to enlarge), one of North America's most photographed, is a product of this thrust. where the upper layers of eastward-moving island arcs were forced over the existing continental crust. The mountain itsef what is known as a klippe; a surviving portion of the overthrust material, left isolated where neighbouring material has been eroded away. One of the clearest displays of superposition is provided by the Grand Canyon. The strata there have been described many times, for example in Prothero's Evolution: What the Fossils Say, in David Montgomery's The Rocks Don't Lie, as chief witness in Grand Canyon, Monument to an Ancient Earth, and at length in the beautiful Geological Society of America 2012 Special Paper collection, Grand Canyon Geology. The Grand Canyon runs across the Colorado Plateau, which was lifted up as a block, without tilting, during the mountain-forming processes that gave rise to the Rockies. Thus the uppermost exposures give an unusually rich collection of more or less horizontal strata, including limestones, desert and marine sandstones, and shales, deposited in a range of environments and dating (with some gaps) from the Permian to the Cambrian (270 to 525 million years before present). So far, everything is quite straightforward. We have unambiguous radiometric dates, a record of changing deposition of environments, and fossils in the appropriate sequence. Throughout much of the Grand Canyon, there is what is known as the Great Unconformity, below which lie a complex and much distorted mixture of sedimentary and igneous rocks, known as the Vishnu Formation. The Vishnu formation rocks are 1,700 million years old or more (this date will be important later), so the gap between them and the Cambrian rocks correspond to more than twice the length of time between those Cambrian rocks, and the present. During that interval, the Vishnu rocks were buried to depths of 25 kilometres, before being forced upwards again during the formation of the continent of Laurentia, and then weathered down to sea level before deposition of the Cambrian rocks described above. The heat and pressure of burial has done much to transform the rocks, but we can still detect cross-bedding in the sandstones, and the accumulation of coarser material at the bottom of the separate layers. Exposed at some places in the Grand Canyon, In between the Vishnu formation and the Cambrian rocks, we have a succession of rocks known collectively as the Grand Canyon Supergroup. These lie parallel to each other, but tilted relative to the more or less horizontal rocks that lie above them. The upper formations (Chuar group and Nankoweap formation) span from 740 to around 840 Mybp (Million years before present), and were laid down on the edge of a then continental shelf, not far from the equator (as shown by magnetic measurements on the rocks), with sea level rising and falling in response to a changing climate. They are rich in microfossils, and display features such as ripple marks, cross-bedding, and filled-in cracks caused by exposed mud layers drying out. The lower rocks, known as the Unkar group, are a total of 2 km thick, and record river and shallow sea sediments, fed by mountain-forming during the assembly of the long lost supercontinent of Rodinia, and subsequent erosion. It spans a period from around 1200 to 1100 Mybp, and lies on top of older granites and schists. It too contains microfossils, and includes such features as mud cracks and ripple marks. In between we have a layer of igneous rock (the Cárdenas basalt), and there lies the anomaly. Early estimates gave an age, based on potassium-argon (K/Ar) dating , around 800 Mybp. But rubidium-strontium dates were around 1100 Mybp, and the theory of radiometric dating tells us that dates obtained using different clocks should agree. The ancillary hypotheses associated with this theory were spelt out over a century ago. Essentially, they are three in number. The first is that radioactive decay rates had not changed over time. Initially, this was an assumption, albeit a very plausible one (why, after all, should there have been a change?) But in 1928 George Gamow showed that radioactive decay was a quantum mechanical process, whose rate depended on the fundamental laws of physics and underlying values of physical constants. Had these been different in the past, so would the laws of physics and, especially, chemistry, and the composition of the rocks (if rocks had formed at all) would be completely different to what is observed. The second ancillary hypothesis, in the early days, was that none of the decay product was initially present. But since the 1940s, we have had methods for estimating initial amounts, using a non-radioactive isotope as a kind of internal calibration. The third ancillary hypothesis is that we are looking at a closed system. To these, as we shall see, we need to add a fourth; that we are agreed on what event the date refers to. In the case of the Cárdenas basalt, the weakest ancillary hypothesis is that of a closed system. Argon, after all, is a gas that can readily escape, giving spuriously young apparent ages. Moreover, the argon age varied with the composition (and hence, perhaps, historical porosity) of the sample being examined. What was really needed, was a method to preferentially sample the least porous parts of the rock. We now have such a method, argon-argon (Ar/Ar) dating combined with thermal desorption. The rock is bombarded with neutrons, which transforms a fraction (we measure what fraction, by including a reference sample) of the 40K originally present to 39Ar.8 We then heat the rock, measure the ratio of 39Ar to 40Ar in the evolved gas, and infer from this the 40K to 40Ar originally in the rock, which is what we need to know. The beauty of this method is that more prolonged heating is selective, both for the most tightly held 40Ar, and also for the 39Ar derived from 40K in that same part of the rock. Applying this method to the Cárdenas basalt, we find that this ratio in the gas given off by gentle heating (i.e. from the regions where it is most loosely held) corresponds to an age of some 700 Mybp, but that incremental heating soon leads to a consistent age of 1104 Mybp, in excellent agreement with the strontium-rubidium. We can then ask further interesting questions. Like what led to the loss of argon. Not heating, because that would have erased tracks made by radioactive decays, so presumably some kind of chemical alteration. What kind, and does this tell us anything about the rocks (now missing) that initially covered the basalts? These remain questions for further investigation. There is another, seemingly much more dramatic, dating anomaly in the Grand Canyon region. To the north of the canyon lie a string of recently active volcanoes, K/Ar age at most a few million years. Yet lead/lead (Pb/Pb) ages9 are some 2.3 billion years, making the rock even older than the Vishnu formations. Why are geologists not worried by this? Because the two different dates refer to two completely different processes. The K/Ar date refers to the eruption of the lava flow, which (in the simplest case) resets the clock by outgassing any argon present in the source rock. The Pb/Pb date refers to the separation from the convecting mantle of the semi-molten lithospheric material at the base of the crust, an ancient process and one that must have taken place even before the basement rocks were formed. This distinction is clearly drawn in the original scientific literature, so much so that I wondered whether or not to regard the distinction as an anomaly at all. However, it is paraded as such in the creationist literature (see e.g. Grand Canyon, Monument to Catastrophe, and many creationist compilations). So the appearance of anomaly has been created by suppression of actual scientific content. Unfortunately, there are many examples of this kind of thing in the creationist literature; for a particularly egregious case, see the Genesis Flood discussion of the Lewis Overthrust fault.10 However, I consider that they can be used as learning opportunities; see here. When I set out to write this essay, I was firmly of the opinion that there is no intrinsic difference between scientific knowledge, and the other knowledge that we have about the world. Now I am not so sure, and there are two reasons for this. One reason is that in each of the examples I have given here an anomaly was resolved within the context of a prolonged, often multi-generational, research programme. Such evidence-guided persistence is rare outside science. The other is the degree of interconnectedness between topics. The reinvestigation of Prout's conjecture led directly to the discovery of argon. But where did all that argon come from? From radioactive decay of potassium, and subsequent escape from the rocks, the kind of escape that gave rise to the apparent dating anomalies in the Grand Canyon. We can use radiometric dating to quantify the geological column, but the results can only be reconciled with the general order derived from superposition, if we recognise that under certain special circumstances this order will be disrupted by overthrusts. Or, to take two further examples, our understanding of evolution is linked to our knowledge of the geological column, and our concerns about global warming arose directly from the analysis of Ice Age climate feedbacks. 1] M.J. Behe, Darwin's Black Box : "The argument from imperfection overlooks the possibility that the designer might have multiple motives, with engineering excellence oftentimes relegated to a secondary role … [T]he reasons that the designer award old not do anything are virtually impossible to know unless the designer tells you specifically what those reasons are." 2] See https://plato.stanford.edu/entries/scientific-underdetermination/, Sec. 2.1. 3] Available at http://www.csun.edu/~vcsoc00i/classes/s497f09/s690s08/Lakatos.pdf ; see also the Stanford Encyclopaedia of Philosophy articles on Lakatos https://plato.stanford.edu/entries/lakatos/ and Popper https://plato.stanford.edu/entries/popper/. 4] Invoking the ideas of Dalton and Avogadro. 5] These are some of the elements that occur entirely, or almost entirely, as a single isotope. 6] Nitrogen and oxygen, when heated or sparked together, give nitric oxide, NO, which reacts further with oxygen and water to give, eventually, nitric acid. 7] This was accomplished initially by reaction with magnesium, and subsequently by fractional distillation. 8] 39K, the major isotope, is struck by a neutron and ejects a proton, giving 39Ar. A co-irradiated sample of known age is used as calibrant. 9] This depends on the ratio of 206Pb (from the decay of 238U) to 207Pb (from 235U), with 204Pb as non-radiogenic referent. Most visitors, especially those who stay on the roads, get the impression that the Belt strata are undisturbed and lie almost as flat today as they did when deposited in the sea which vanished so many [million] years ago. Actually, they are folded, and in certain zones they are intensely so. From points on and near the trails in the park it is possible to observe places where the beds of the Belt series, as revealed in outcrops on ridges, cliffs, and canyon walls, are folded and crumpled almost as intricately as the soft younger strata in the mountains south of the park and in the Great Plains adjoining the park to the east. Mercury precession image from Georgia State University site. Chlorine isotopes from Chemguide. Ramsay image Vanity Fair via Wikipedia. Geological column cartoon retrieved via The Oldspeak Journal; would happily acknowledge original provenance. Overthrust diagram, Myrna Martin in Kids Fun Science. Aird da Loch image, Andrew (ARG_Flickr on Flickr) via Wikipedia. Chief Mountan, public domain (US National Parks Service ), via Wikipedia. Grand Canyon stratigraphy, US National Parks Service, public domain, via Wikipedia. I thank Ken Wolgemuth, Massimo Pigliucci, Michael Roberts, Martin Rudwick, and Mike Timmons for helpful correspondence. The responsibility, however, for the errors that I have no doubt committed in this piece is entirely my own.